There is nothing like being in Kolkata, once you’re in the city it feels like your own. There’s a certain power in this place that courses through your body, the power of Goddess Durga, the heavenly feeling of walking through its streets, walking along its Ganga ghat, the flow of literature rich in its meaning and words within each one’s blood, all thanks to Tagore and some renowned maestros. Kolkata, the city of unbound sweetness, the city of art and culture. It is not just expressive through its art but also its distinct taste and food habits, its dressing style to its highly educated talks and debates as a daily routine of the Bengali folks, here. Many think its not the ideal place to shop though, which isn’t quite true because there is nothing like shopping here than anywhere else. 1) New market- located in the heart of the city, the magnificent New Market, officially known as the Sir Stuart S. Hogg Market (colloquially Hog Shaber Bazar or the Market of the Sahib Hogg) is a vital part of Kolkata– your shopping is incomplete without a visit to this Victorian Gothic arcade from the mid 1870s. Almost anything and everything can be found here – from clothes, perfumes, jewellery, and electronics to flowers! There are atleast 2000 odd stalls, grouped into blocks, in accordance to their priced offerings. You can always strike a very profitable bargain on these products. Its a mix of history and past with strongly rooted cultural diversity in its Indian fabric, here. 2) Gariahat Market- everybody’s go to destination, an expert of all things concerning shopping is this place. 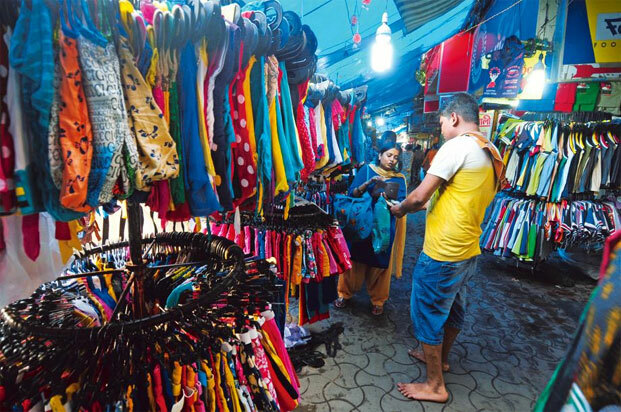 This buzzing crossroad is always crowded with all sorts of garment sellers – both retail stores and hawkers – selling a vast majority of materials, designs and outfits for all types of occasions. If you want to buy a sari or indulge in the latest western designs well this is the absolute destination of a shopper’s delight. To add to that there are some really big mega-stores as well as malls that have cropped up in the area like Mukti World mall, Gariahat AC market and Gariahat mall — they all house affordably priced goods of diverse brands. 3) Dakshinapan Shopping Center- Its known for its open air spacial shopping arcade and also the best place for Indian handicrafts and trinkets. There are several state owned stores here, selling an assortment of various handicrafts, which are very affordable and reliable bargaining will have even more profit added to your budget. If here, don’t forget to buy the very famous terracotta (burnt-clay) horse solely from the Bengal hamlet of Bishnupur. While doing all this walking and bargaining if you need a respite and quick tea break, well, there’s always the Dolly’s Tea Shop for a sip and bite. 4) College Street Market- it’s the Bookworm’s Paradise, well that’s what we can call it in the layman’s term, with that spacious and large acres of land stretching across a whole path to house several affordable and diverse themes and variety of genre in books. 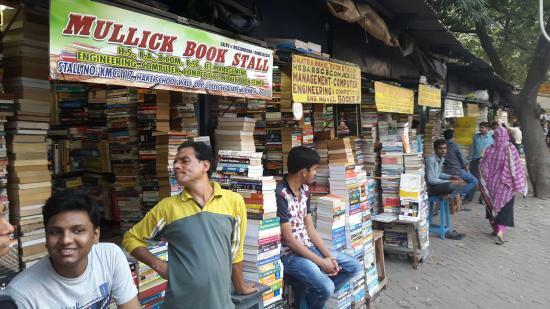 This million square feet, College Street is also called Bibliophile’s paradise. One of the largest market for second-hand books in the whole of Asia, if you can’t find a book you have always wanted to possess anywhere else, it’s definitely bound to be here, its a treasure trove of first editions, paperbacks in all Indian languages and all kinds of pamphlets as well as eminent out of print books from across the world – with little damage to your pocket! 5) Hatibagan Market- this stop can be reached after you are done exploring your reader’s paradise, hop on one of the trams that lead you from College Street to Hatibagan, its the northern counterpart of Gariahat. Take a look around the place for all the variety of exotic products ranging from that of shoes and cosmetics, or the fine dining wares from the street hawkers. Make way into your wardrobe for more saris of traditional kinds with an assortment of finest silk or cotton materials with no binds on the cost of these products. As it is already known in Kolkata, everything is absolutely affordable and very pocket friendly. So, take some time out of your daily routine, its time for some fun, shopping and some good experience in food and cultural art! A change of taste is best for the heart’s getaway!